The Vought F6U Pirate was the company's first jet fighter. A specification was issued by the US Navy's Bureau of Aeronautics ("BuAer") for a single-seat carrier-based fighter powered by a Westinghouse "24C" (later "J34") turbojet, on 5 September 1944. In December of that year, Chance Vought was awarded a contract for three prototypes, with the initial "XF6U-1" prototype flying on 2 October 1946. The Pirate was an uninspired design, with the intakes slung under the wing roots, exhaust in the tail, fitted with straight wings and tail surfaces, plus optional wingtip tanks. The aircraft featured unusual construction techniques, including "Metalite" skinning of balsa, sandwiched between two thin sheets of aluminum, and "Fabrilite" skinning of balsa, sandwiched between sheets of fiberglass for the vertical tail and air intake. Production aircraft had two auxiliary fins, one towards the tip on each side of the tailplane. While not quite as conservative in design as the Ryan FR Fireball (which included a propellor and piston engine for takeoff and landing, and only used its jet for high-speed cruising), it was still very much a piston-engined aircraft design fitted with an underpowered jet engine. The first XF6U-1 prototype was powered by a Westinghouse J34-WE-22 turbojet with 3,000 lbf (13.34 kN) thrust, one third of the weight of the aircraft. Therefore the prototype was seriously underpowered. 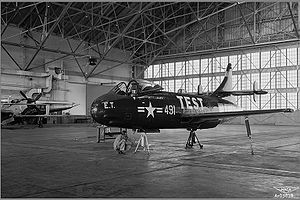 To help improve the aircraft's performance, the third prototype, which first flew on 10 November 1947, was fitted with a Westinghouse J34-WE-30 afterburning engine of 4,224 lbf (18.78 kN) thrust, the first United States Navy fighter to have such a powerplant. The first production F6U-1 performed its initial flight on 5 March 1949, and 20 of the aircraft were provided to a Navy operational evaluation squadron. The judgement from the evaluation was that the Pirate was unacceptably unimpressive. Naval aviators disparagingly called the F6U the "groundhog". On 30 October 1950, BuAer informed Vought of the Navy's opinion of the Pirate in terms both bureaucratic and scathing: "The F6U-1 had proven so sub-marginal in performance that combat utilization is not feasible." The aircraft ended up being used to develop arrester gear and barriers, and transitioned at least one Texas Naval Reserve squadron to jets.